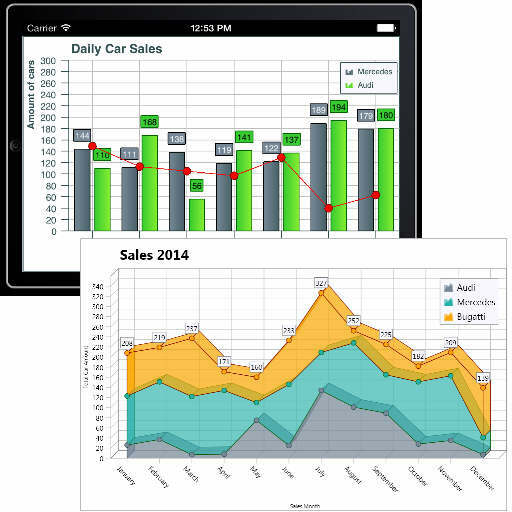 TMS Software has released a new component for Delphi XE5 Firemonkey called TMS Charts. This is a cross platform charting component which runs on Android, IOS, Windows, and OSX. It has an optional configurable background grid and an optional 3D drawing mode. The chart types that it supports are bar, grouped bar, absolute stacked bar, percentage stacked bar, area, stacked area, line, digital line, XY line, and XY scatter. It supports a legend with glyphs, annotations at each series point, a design time editor, and a large number of events for customization. The two screen shots they have are pretty nice looking charts. It is a commercial component but there is a free trial available. It seems like a pretty low cost charting component and it is also included in the TMS Components for Firemonkey pack. Head over and download the free trial of TMS Charts for Firemonkey and check it out.